As a rule, owners of construction companies keep to a tight budget at the initial stage, that's why they need both effective and cheap solutions to promote their start-ups. A website is one of them today, and this theme will be helpful to create a user friendly design for it. Due to its minimalistic appearance with clean layout, your web resource will seem professional and serious to visitors. To brighten up its formal look a little, orange icons, buttons, and other elements have been embedded into the template's layout. The latter is structured in a way that will let you present various facts about your company all in one place. From its services and projects to team and location, every content block of this theme will favor your business promotion. This is the most popular HTML and CSS based framework that contains variations for the main components found in the HTML coding. Thanks to the use of Bootstrap a website will be able to adapt its content to any display size. It's necessary for both Search engine optimisation and website visitors. Parallax scrolling is a front-end visual technique which involves images moving more slowly compared to the background to create a "multidimensional" illusion. It will make an intense impact for the visitor, consequently cultivating a significant audience and forcing visitors to stick to the web page. It's actually a easy way to add a highlight to a one-page website, revive an infographic, tell a story or show off a portfolio. The portfolio is some type of an album, demonstrating examples of your jobs. For an interior designer that might be images of suites he designed, for web-developer, it's a set of websites he built. The portfolio is really a business presentation of your skills. A well-made portfolio that exhibits the finest work is a solid addition to resume and cover letter. It demonstrates a work experience, a personal style and, above all, talent. Responsive design renders a web page very same perfectly on any specific screen size. Responsive website design helps to improve consumer experience and provide you with a full access to the internet site data from any electronic device. WordPress Multilingual digital products may be translated in a variety of foreign languages effortlessly, thus allowing you to set a multi-lingual website page. WPML ready layouts lets you setup a web presence in numerous spoken languages. Search Engine Friendly is the type of website design that enables the search engine to examine and index its pages. While clients put your trust in search engines, therefore websites that show up in the top of search result raises the amount of customers and provide high income. Do you provide any scripts with your WP themes for Architecture Blog or could you do some custom programming? Our templates do not include any additional scripts. Newsletter subscriptions, search fields, forums, image galleries (in HTML versions of Flash products) are inactive. Basic scripts can be easily added to a WP template for Architecture Bureau at www.TemplateTuning.com If you are not sure that the element you're interested in is active please contact our Support Chat for clarification. What is a one time usage license for a Contractor Company WP theme? When you buy the Contractor Company WP theme at usual price you automatically get the one time usage license. It enables you to use each individual product on a single website only, belonging to either you or your client. You have to purchase the same template again if you plan to use the same design in connection with another or other projects. When passing files to your client please delete the template files from your computer. Is it possible to reactivate my download link for Home & Family Blog WP theme if it was deactivated after 3 days? Yes. Please re-activate the download link for Home & Family Blog WP theme within your account under the Downloads tab or contact our billing department directly regarding that. Can I resell the Architecture Company WP template as is? No, you cannot resell the Architecture Company WP template as is. Are there any discounts if I'm buying over 10, 20, 30 or more WordPress design theme for Home & Family News ? Please email to marketing@templatemonster.com with your inquiries about WordPress designs for Architectural Contractor. Is it possible to buy the particular image from the Design & Photography WordPress design? No. According to our Terms and Conditions we never sell the images separately from WP themes for Home & Family Blog (as well as the templates separately from the images). Can I put a line at the bottom ( or any other spot) of the customized WordPress theme for Design & Photography "Website design by Company name"? No, you cannot place a line at the bottom ( or any other spot) of the customized WordPress theme for Design & Photography saying "Website design by Company name". Nevertheless, you can place "Customized by Company name". I like the image from the WordPress design theme for Home and Family and would like to use it for my advertising campaign, can you send me this image in a higher resolution? No, we can't provide image in higher size or resolution rather than it is on the WordPress design theme for Home and Family. We recommend looking for professional images on online photo resources. Are images included in the WordPress themes for Designer Portfolio released under GPLv3.0 license? In the WordPress themes for Designer Portfolio released under GNU GPL v3.0 images are not included and are used for demo purposes only. Can I put low resolution thumbnails of WordPress design themes for Photography Blog on my website for my clients to choose designs? Can I resell the customized Contractor Company WP theme? No, you cannot resell the customized Contractor Company WP theme as a template but you may sell it as a project to your client (see paragraph 1 ONE TIME USAGE LICENSE for more details). Will the Construction Company WordPress theme be deleted from TemplateMonster database? No, the Construction Company WordPress theme will not be deleted from TemplateMonster database. Are there any restrictions for using imagery, cliparts and fonts from the WP theme for Design Store I purchased? All imagery, clipart and fonts used in WP theme for Design Store are royalty-free, if not stated otherwise on the product page, and are the integral part of our products. One Time Usage License and Developers License give you the right to use images, clipart and fonts only as a part of the website you build using your template. You can use imagery, clipart and fonts to develop one project only. Any kind of separate usage or distribution is strictly prohibited. Can I put a line at the bottom (or any other spot) of my new product "Website development by Company name" after purchasing WordPress theme for Home & Family Magazine? Yes, you can place a note at the bottom (or any other spot) of my product "Website development by Company name". Nevertheless, you cannot place "Website design by Company name"while using one of WordPress theme for Home & Family Magazine. Is it possible to use your WP themes for Photography to develop websites for my customers? Yes. It is perfect for designers who want to offer their customers a high-quality design and also save time and money. Keep in mind that when you purchase the WordPress design theme for Home and Family with ordinary or exclusive license you're entitled to create only one project (one domain name). What is GNU GPL v3.0 license and can I use it with Home WordPress template? If you buy a Home WordPress template released under GNU General Public License v3.0, you can use it on any number of projects belonging to either you or your clients without any limitations. This license allows you to modify the template and its sources to suit your needs. Can I integrate the Design Blog WordPress design theme with third-party software or applications for development of my new products? No, you cannot get the developers license for development of Design Blog WordPress design theme or other products. 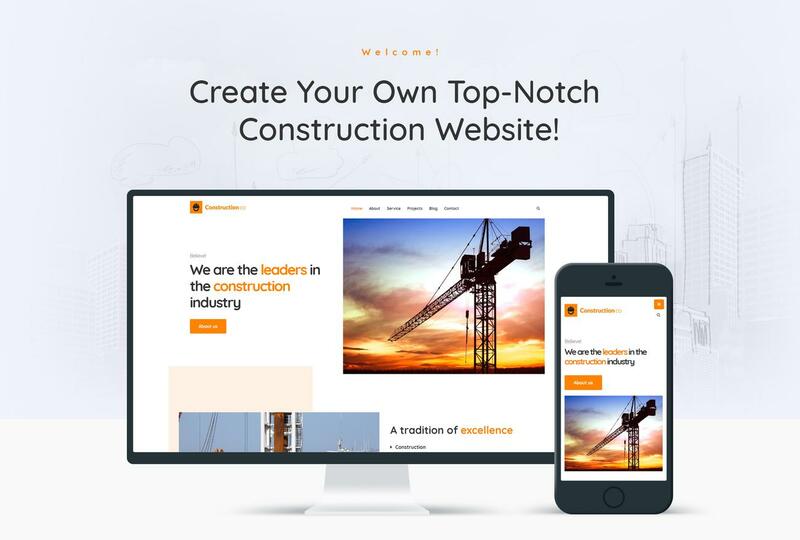 What are the advantages of purchasing a WordPress design for Construction Corporation? The major advantage of purchasing a WordPress design for Construction Corporation is price: You get a high quality design for just $20-$70. You don't have to hire a web designer or web design studio. Second advantage is time frame: It usually takes 5-15 days for a good designer to produce a web page of such quality. 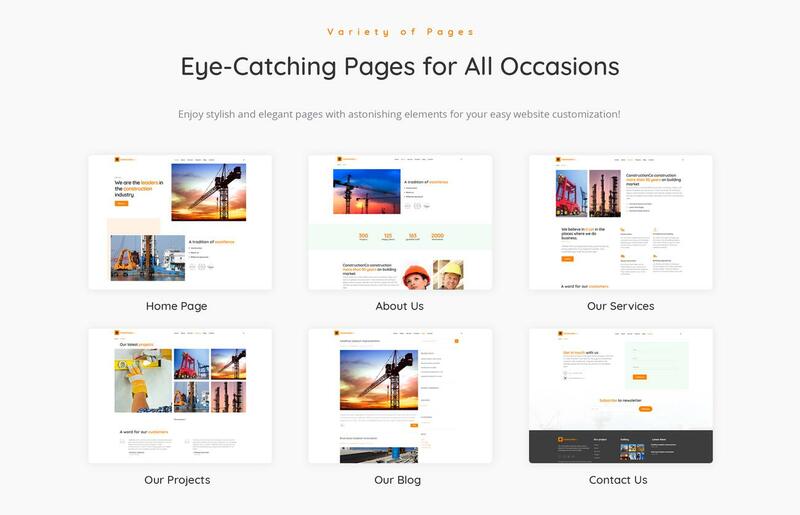 Are there any limitations on selling the Construction Company WordPress theme as the integral part of my new product? In what cases I don't need the extended license for Building Company WP themes? Is it possible that Template Monster will contact my client which website I made from Template Monster's website WordPress design theme for Home & Family News ? Yes, our legal department checks licenses regularly. In case we won't find designer's contact information on the site which was made from the WordPress design theme for Home & Family News of ours we will contact the owner of the site directly. How can I modify Architecture Company WP template to suit my particular website? Please visit our Online Help Center to obtain detailed instructions on editing Architecture Company WP template. What is Extended License for Design Shop WordPress theme? 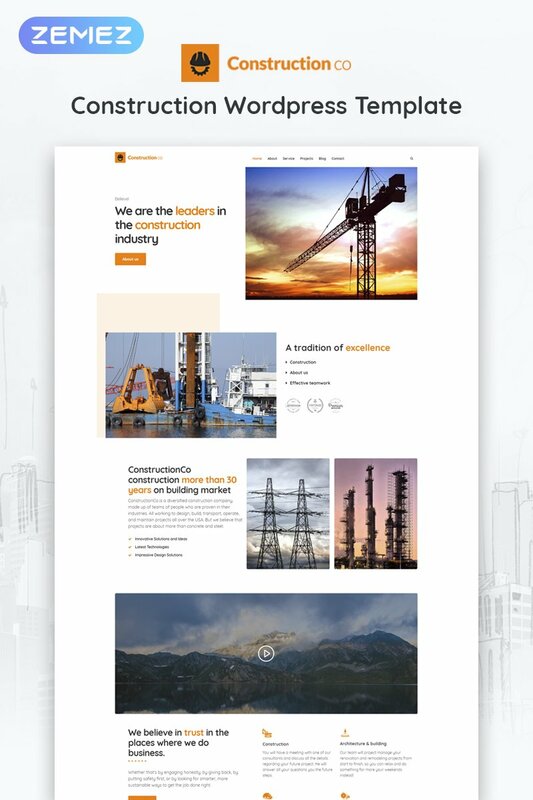 Will TemplateMonster help me to edit my WP template for Construction Agency? TemplateMonster offers you a variety of sources to help you with your WP template for Construction Agency. Use our comprehensive Online Help Center to get the basic knowledge about your WP template for Construction Agency. Our Knowledgebase contains customers questions and most frequent problems. Anyway, you can always use TemplateMonster 24/7 phone support, try our Ticket System or Live Support Chat to get qualified assistance from our support representatives. Make sure that these charges for WordPress template for Renovation Contractor have different order IDs. If it is so, contact our billing department. Can I use graphics from Construction Company WordPress theme I purchased for use in printing? Yes, it's not prohibited to use the Construction Company WordPress theme graphics for printed material, but the resolution of the templates graphics ( except for logo templates) is not enough for printing. Will you help me to customize my WP template for Photography Portfolio? We do not provide any help or instructions on WP template for Photography Portfolio customization except for www.template-help.com help center. If you are not sure you can customize the template yourself we recommend to hire a design studio to customize the template for you. I&#039;ve purchased several templates from TM and this is by far my favorite. It&#039;s clean and easy to manage!! Bardzo dobra templatka, sprawdziła się świetnie, nie było problem&oacute;w z kompatybilnością. Dało sie też przyspieszyć (nie było strasznie dużo zbędnego kodu) . Template is nice but won&#039;t allow videos in the header which we needed? It is a great template. It is easy to install and customize. If you have your own business i recommand it to use for your own constraction&#039;s company website. again this template is very easy to customize and I am very happy with the endless possibilities. Dieses Template ist sehr klar strukturiert und sehr vielseitig einsetzbar. Die Installation gestaltete sich ebenfalls sehr simpel, man hat schnell eine Grundlage geschaffen, auf der man arbeiten kann. Ein weiterer Pluspunkt ist die schnelle &Auml;nderbarkeit der im Template vorherrschenden Farbe (orange) in jede beliebige Farbe. Auch Anf&auml;nger kommen gut mit diesem Template sowie dem Cherry Framework zurecht, da es sehr selbsterkl&auml;rend ist. Quick and easy configuration of this template brought our site online nice and quick. Great documentation included with the theme, everything was easy to find and easy to customize to our needs. This was my first website I built and started off being a little tricky. I got through it though with a lot of help from template monster and wordpress online chat. They were able to really help me when I was stuck and show me how fix the problems I have. I would defiantly get another wordpress template in the future. can use it without worldpress? have rtl version?